In South Africa, municipalities (local governments) are responsible for providing basic services such as water, sanitation, refuse removal, and electricity to the people living in the municipal area. Local governments often appoint private service providers for one or more of these services on a temporary basis to people living in informal settlements. When the estimated service costs exceeds R200,000 – which is almost always the case when basic services are provided by the private sector – the municipality must follow a competitive bidding process to appoint a service provider. When the municipality follows this public procurement process, it produces a number of documents, some of which should explain exactly what the service provider is supposed to deliver. For example, if the service provider has to provide chemical toilets to a community, the documents should provide information on how many chemical toilets should to be delivered to the community and how often these toilets should be emptied and cleaned. 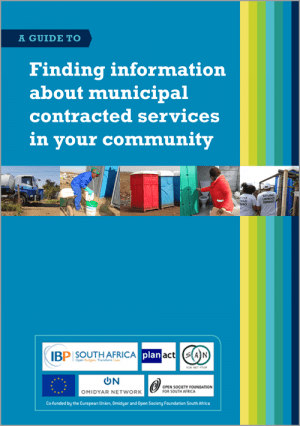 This guide is designed to help informal settlement communities find the documents that provide information about a service being delivered to their community. They can use this information to monitor if the service is being delivered according to the contract and to engage with the municipality to improve the delivery of the service.